Amazon is looking to woo small business owners with an attractive new credit card offering, Bloomberg reported on Monday. According to Bloomberg’s anonymous sources, the online market retailer has been in talks with JPMorgan Chase to offer a co-branded credit card tailored to the needs of small business owners. The card will reportedly provide reward points for purchases made on Amazon, and in the future, the possibility for Amazon to branch out and offer other business-related services to smaller companies, such as business insurance. One Bloomberg source said that Amazon could tap into customer transaction data to further customise perks attached to the card. While Amazon already provides credit cards through its partnership with Synchrony Financial and JPMorgan, this will be the company’s first reported foray into a credit card suited to the needs of small businesses. But Amazon is far from alone in its attempt to corner the small business credit card market. Amazon’s edge, however, might lie in its already cosy relations with small businesses owners which make up a potential market that the Seattle-based company has long been courting. In December, the company stated that half of the inventory sold on its site was provided by boutique retailers. 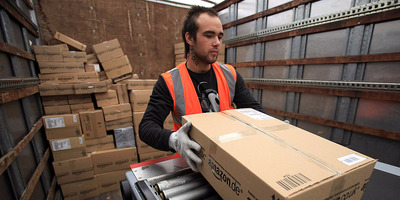 The company’s Fulfillment by Amazon program provides small businesses with the option to offer Prime shipping by allowing Amazon to manage the business owner’s packaging, shipping, and customer service needs – an attractive offering for small business owners who might otherwise struggle to outsource their products.